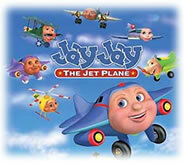 JAY JAY THE JET PLANE, one of the world's most popular, entertaining animated characters, has landed at PBS as a daily preschool television series. 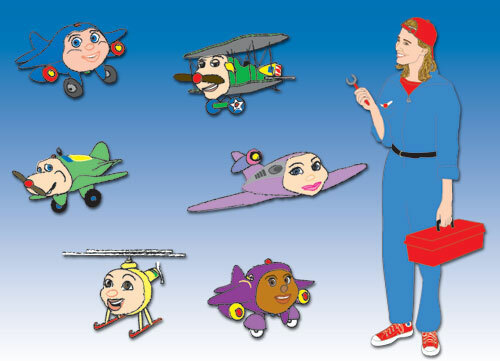 Jay Jay and his airplane friends bring stories of fun and adventure, all from their magical home at Tarrytown Airport, "where imagination takes flight!" Jay Jay. Male. 6 years old. Small jet airliner. Mary Kay Bergman made his voice. Tracy. Female. 6 years old. Small jet airliner. Normal hearing, but understands American Sign Language. Herky. Male. 5 years old. Helicopter. Has skids instead of wheels and cannot taxi on the ground. Big Jake. Male. Adult. Father figure. Cargo carrier. Propeller-driven. Savannah. Female. Adult. Mother figure. Supersonic airliner. She was made at Savannah in Georgia (USA), hence (in the story) her name. Oscar. Male. Old adult. Grandfather-like figure. Old biplane. Brenda Blue: Woman in bib-and-brace overall and usually wears either red or blue cap. In charge of the airport, and is the mechanic. She does not use the airport's control tower but communicates with the planes by a portable two-way radio from the ground. Played by actress / child psychologist Eve Whittle and Vanessa Stacey in the UK version. Mrs. Blue: is Brenda Blue's mother who sometimes visits Tarrytown Airport. Miss Jones: is a deaf librarian at Tarrytown Library who knows American Sign Language. Easy O'Malley. He founded EZ Airlines and his cousins are Grumpy O'Malley (lives at Dewdrop Farm), Pierre O'Malley (lives in France) and Tex O'Malley (lives in Texas). There are other human characters who appear from time to time. Tarrytown Airport is run by a small firm called EZ Airlines. In Tarrytown is a school called the Michael O'Tarry School. Breezy: is a Monarch butterfly. One episode shows Jay Jay following Breezy's long autumn migration from Tarrytown to a hibernation site in a mountaintop forest. Bobby Bee and Billy Bee: are two bees. They first appear in the episode Catch the Buzz where they accidentally get into the electronics of Big Jake and Herky (in that order) causing locomotor ataxia forcing Big Jake and Herky to land until Brenda Blue goes inside them and investigates. Friends taking off and friends touching down. 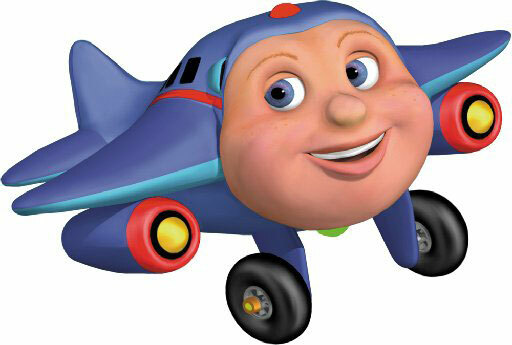 Jay-Jay, Jay-Jay the Jet Plane. 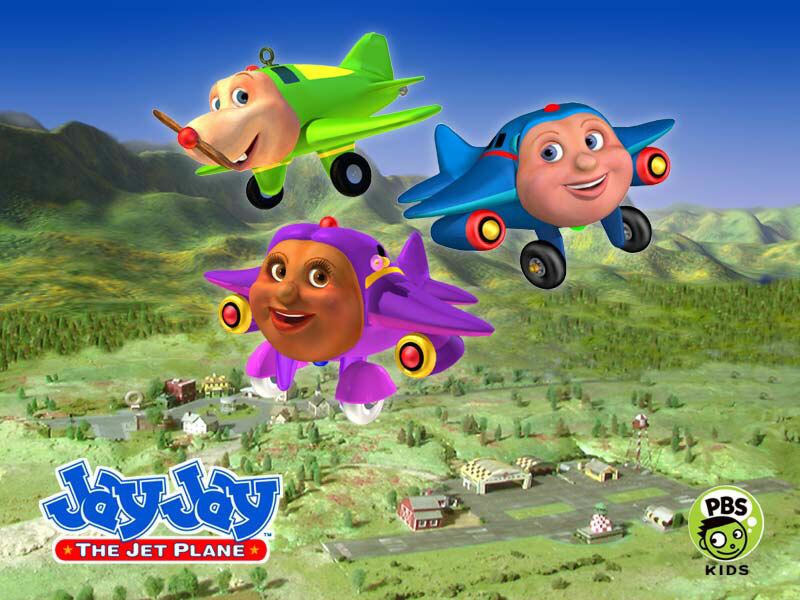 With Jay-Jay, (Jay-Jay) Jay-Jay the Jet Plane.